If you watched Islay on BBC 2 earlier this evening I hope you enjoyed it, if you haven't you should now be able to watch Oz and James Drink to Britain Episode 3 online (at least in the UK). But that's not really the topic of this entry. Instead I'm going to write about my bedroom and Islay sunrises. Yes, really. Regular readers will have seen this before, it was my New Year's picture last year and also featured on my Islay photoblog recently. It's the sun rising over the Kilchoman Crags at Machir Bay on a beautiful October morning. Probably one of my favourite Islay pictures ever. 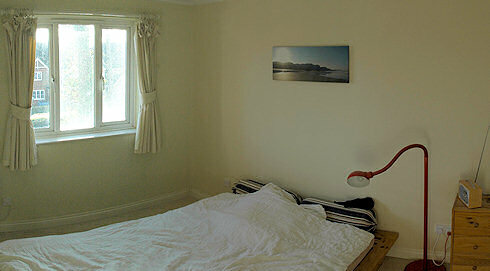 A few months ago I had this and another Islay panorama printed on canvas by Mark Unsworth of Islay Studios. While he obviously sells a lot of fantastic Islay pictures he took himself he agreed to print them for me. I very much like his pictures, but the emotional bond to pictures I took myself and the memories attached to them makes me want my own pictures on my walls. Getting them printed by Mark I knew someone who knows the places and the light, someone I could trust, would do it. He did a fabulous job, they turned out extremely well. So I now go to sleep under an Islay sunrise and wake up under an Islay sunrise, even though I'm unfortunately 450 miles or so away from it. Good night for now, on Islay and elsewhere in the world! PS: This entry was written with a view of an Islay sunset, but more about that some other time.